We will truly never understand the mysterious minds of cats. 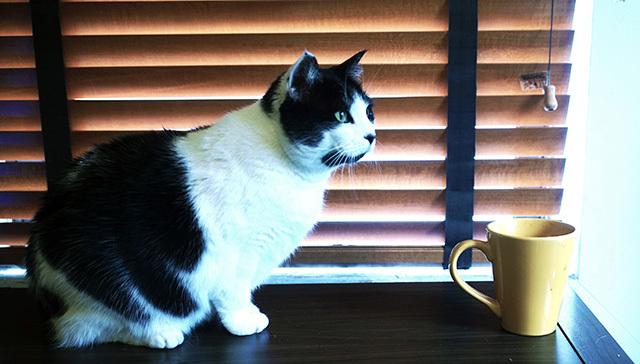 Among the many enigmas of feline behavior is their apparent love of coffee. I first noticed this when my friend Alex started texting me pictures of his adorable football-shaped kitty Pickle (also known as Mrs. Tween) trying to get her big furry head into a paper coffee cup! Polliwog, the kitten I bottle fed and fostered and my cat Fivey have also licked the cup a few times. But are cats and coffee a thing? I consulted the dark corners of the Catnet and came across a multitude of corroboratory anecdotes. But why, catlings, why? I’ve come up with a few theories of my own. Cats have about fourteen times as many olfactory sensory glands than humans do. Have you ever seen your cat smell something, then open its mouth to a strange halfway position? When you see this, your cat is using a special organ dedicated to smelling call the vomeronasal organ (Jacobson’s organ). According to cathealth.com, “Odors are inhaled to the tongue, the lip is slightly curled, and the tongue is rubbed on the roof of the mouth. Then the mouth, nose, and vomeronasal organ in some way allows the animal to sense the essence of the flavor and scent in a way that we do not have the capacity to experience.” Maybe cats are attracted to coffee for the same reason we are. Because of it’s wonderful aroma and taste. Cats have a “bitter tooth”. A study published in the journal PLOS One found that cats have 12 different receptors in their tongues for bitter taste. Seven being highly active. Coffee is bitter– simple as that right? Actually, the reason cats can taste bitterness is for their protection. Felines are hard-wired to know that poisonous plants, snakes and frogs for example taste bitter. Infact, coffee in large amounts is harmful and could even be fatal to your cat! A few curious licks of coffee is fine though. I would recommend getting an adorable picture of your cat slurping your coffee for Instagram and then take it away! Sometime we all want things that aren’t good for us. 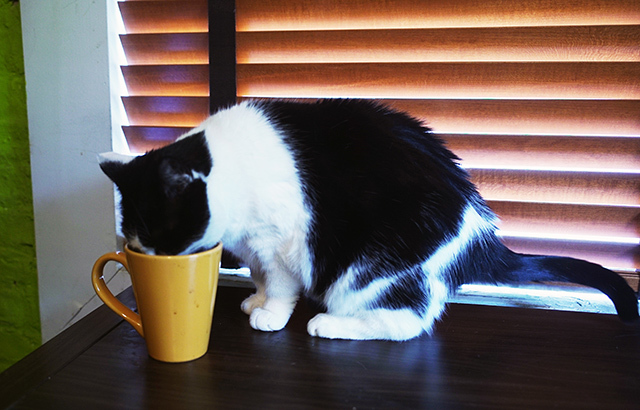 Cats like coffee because they’re weird and do strange things. It gets more unusual! Coffee isn’t the only human delight cats like. Besides the obvious meat/fish/chicken it’s known that cats like to eat bread of all types, olives, popcorn, watermelon and ice cream. Veterinarians believe these odd food choices are appealing to cats for different reasons. 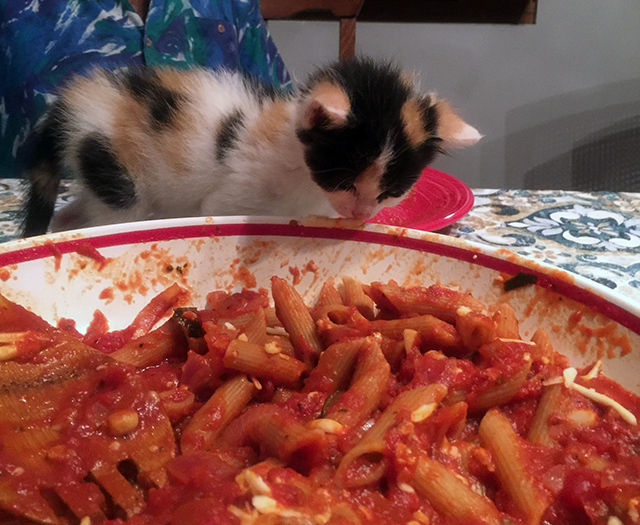 Cats are attracted to food not only because of aroma but because of the shapes and textures. Your cat may be eating watermelon not for it’s sweet taste (they have minimal sweet taste buds) but for watermelons water content (your cat is thirsty). My cat Fiver loves popcorn! This makes sense because corn meal is a common ingredient in dry cat food. That said, I wouldn’t’ start giving your cat ice cream or any of these foods! It’s best for them to stick to their natural carnivorous diet.